Reallusion is running its Animation@Work Competition again. I've been away, not writing blog posts, so I could focus entirely on getting my entry done. Now that it's finished, this post I'm going to run through the creation of my entry and highlight some of the techniques I used to create it. 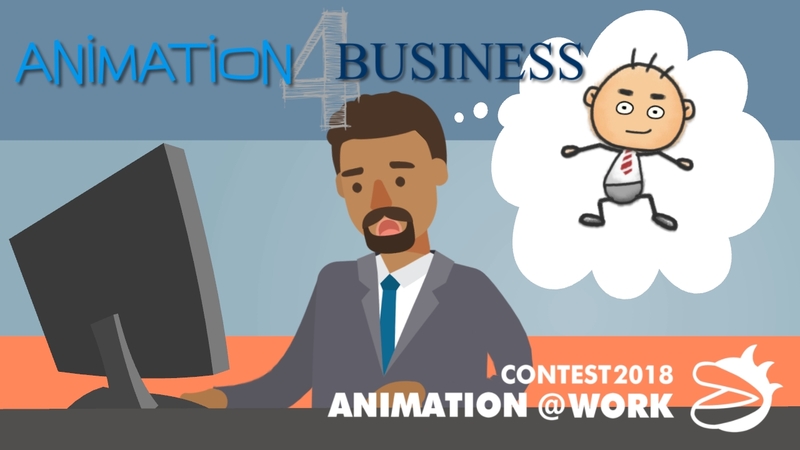 As per 2014's competition I'm entering the Business Animation section of the competition, presumably playing to my strengths, and allowing me to create an animation entirely from pre-existing content store library elements. This category is judged mainly on story, story tempo, sound design and animation skill. There is a preference for significantly modified content store characters but it's not an essential requirement (which is where my entry is at its weakest - none of my characters are modified at all from their base character). My goal was to create my entry as quickly as possible. 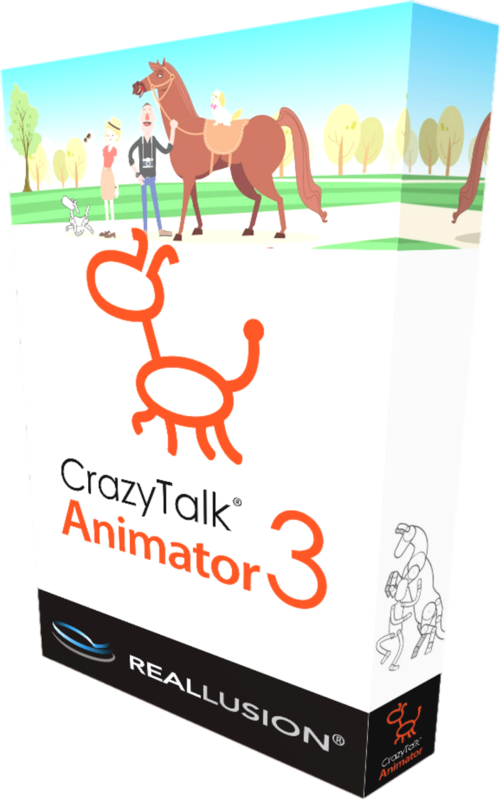 Reallusion has always promoted CrazyTalk Animator as a fast animation workflow and I wanted to see just how quick I could create a two minute business explainer video with it. All up, my entry below was created in 16 days (working about 3-4 hours each day), however those 16 days were spread out over about a month. 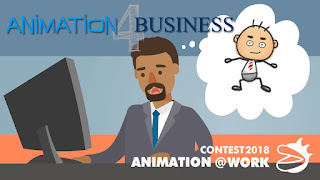 Be sure to watch the animation which is promoting my Animation 4 Business service, then continue reading for my behind the scenes insights. Right from the beginning I wanted to see if I could create an animation in the same style as those my team and I regularly create with Vyond (formerly GoAnimate). Reallusion's Elastic Folks (Occupations) and Sapann Design's Business and Casual People packs are both very similar to the style of Vyond's Business Friendly and Business Contemporary themes so were the obvious choice of characters. I wrote the script over a couple of days. Initially going for something funny, as evidenced by my opening scenes, but then settling for a more straight forward script just to keep things moving. I knew I wanted to keep the tempo fast paced, originally to make the humor work better but ultimately to try and not give the viewer time to tune out at any stage. 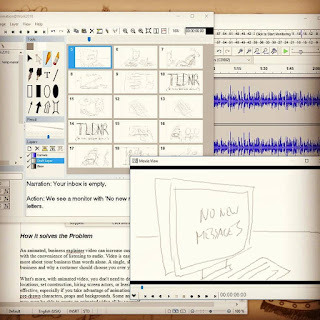 Once I had my script I roughed out a storyboard in Springboard, recorded a very rough cut version of my narration, which I used to roughly time the scenes for my animatic in Springboard. I wouldn't say every scene I storyboarded was award winning material but a few I was very happy with. Others were the best I could come up with out of the few ideas I had. Again I just wanted to keep the production moving. As you can see from the image my storyboard is very rough. There's no sense in making a storyboard pretty if you're the only one who will every refer to it. So long as you know what the squiggles mean, that's all that matters. I was pretty happy with my animatic so I moved straight on to animating each scene as individual project files in CrazyTalk Animator 3. Animating the individual scenes took eleven of my sixteen days. I pretty much started at scene one and animated sequentially right up until my final scene thirty. 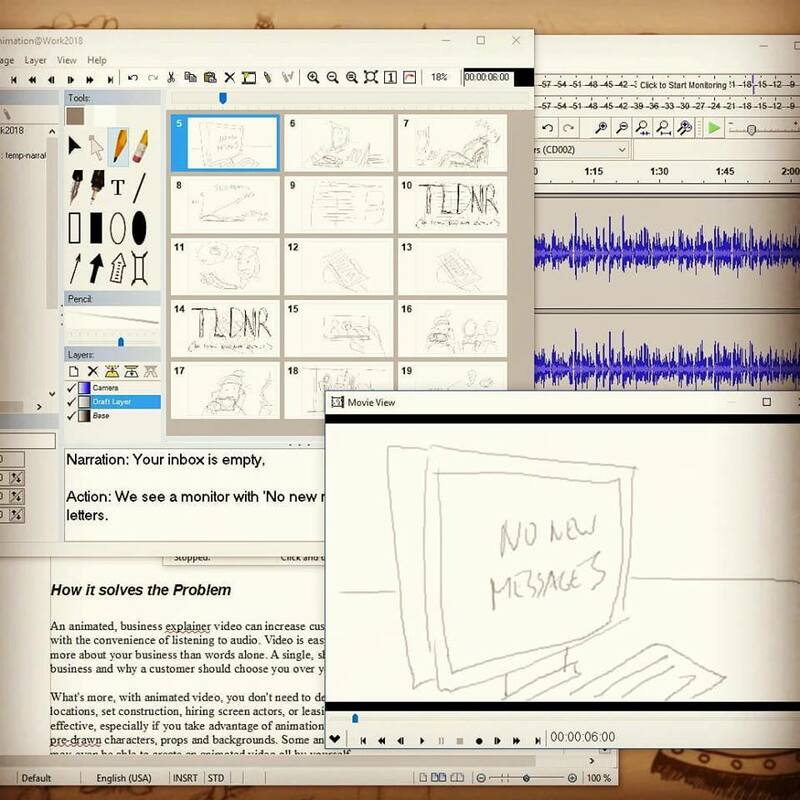 I used my animatic to set the length of the project file in CTA3. Once each scene was completed I exported the key frame that most matched my squiggles in the storyboard to replace them with. This would give a final, presentation storyboard and animatic that I could view before assembling all the scenes in my video editor. To be honest I didn't really need to do this but it does give a sense of how the final animation might play before you assemble it. Whilst it may look like everything was sourced from Reallusion's Content Market Place there are in fact quite a few customised props and scenes. All of the text was created in a graphics editor and saved as PNG files so that they could be animated using CTA's Elastic Moves feature. Whenever I needed a prop I didn't have I would head on over to Open Clip Art to see what they had (which is where my expensive production crew got all their free equipment from). I also designed and created my CTA3 box prop using 3D Box Shot Maker. Although most of my scenes were very simple, not one used an existing pre-made template. All my backgrounds were pieced together from individual props. I spent much of my time searching through CTA's Content Manager (or should I say 'Mis-manager') folder by folder because Reallusion has yet to include a feature that lets you type in a keyword to find what you need. Many of my props came from G2 content packs, which made full use of CTA's Render Styles feature. This meant that anything that had a black outline could have this instantly removed, to match my characters, just by turning the outlines off. for this scene - CTA needs Search! The most complex scene in the entire animation is the interior train scene. It doesn't look like much but it took three hours (that's three hours if anyone from Reallusion's CTA development team is reading this) to find all the components in my content manager (and it's only made up of six components!). The majority of the character animation uses existing motion library files that I've modified to suit the movements I need. For example, in the interior train scene (pictured above) I used character idle motions and then moved their arms to be positioned holding up their phone and holding onto something to keep them stable. 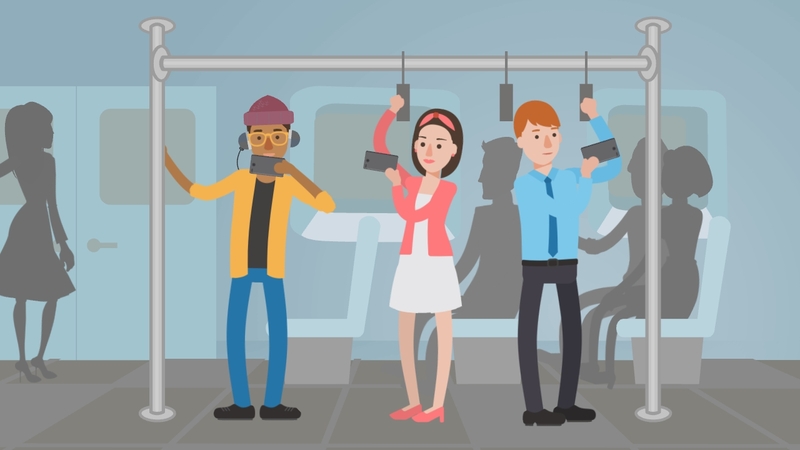 The women with the pink cardigan and the man in the blue shirt use the exact same motion file. I just flipped the man and offset his movement so he wouldn't mirror the woman's at the same time. Because most of the facial animation didn't require anything too complex I was able to manually puppet most of this for head turns and eye blinks. Quite a lot of the prop animation makes use of the new Elastic Motions for that bouncy spring effect when props enter or exit a scene. Even my little piggy bank in the money bags scene uses an elastic motion from the Spongy Moves pack to give a smug little wiggle at the cost savings. found in Reallusion's Transition Pack. 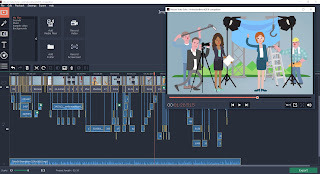 Most of my transitions between scenes were done in my video editing software except for two vertical bar transitions used to transition my too busy business man between stages of being able to make a video through to not being skilled enough to animate a video himself. The vertical bar transition comes from Reallusion's Transition Effects pack. I could have created this effect in my video editing software too but I bought the pack and I wanted to at least use it somewhere. This seemed like the ideal place since the entire sequence of the business man is all one CTA3 project file. Before I started piecing together my final edit I sat down to rerecord my narration. As mentioned my first recording was just a rough read through to give me something to time my animatic to. This time I sat down in front of the best microphone I own and Audacity to get the very best quality recording my knowledge and equipment could muster. Prior to this I was considering hiring a voice artist to do my narration. In the end I decided I wanted to keep this as much a one person project as possible, and I really want to get better at doing voice overs... so this was a good opportunity to practice, knowing people would be hearing it. To make sure I gave my best performance I even went to the point of doing mouth exercises and psyching myself up to make sure I'd speak clearly and maintain the fairly quick tempo. I ended up using take six out of six full attempts and a few halfway through fails. I used Movavi Video Suite to edit all the scenes of this animation together. 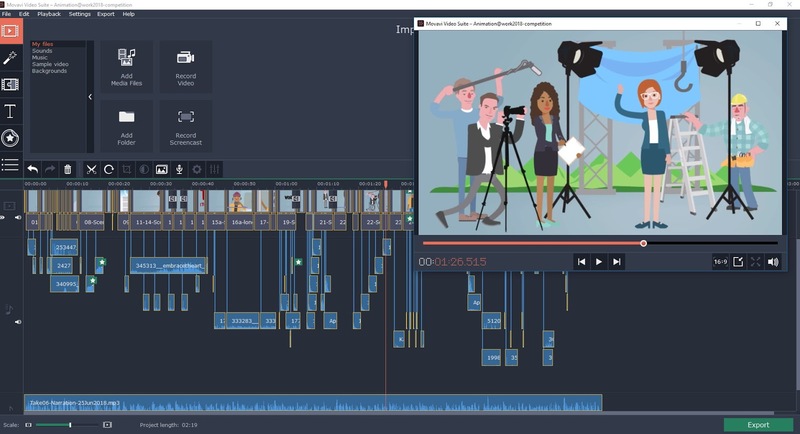 The included Video editor is pretty powerful and easy to learn. It's definitely not the best video editor out there (and is a little unconventional) but it just works, and can import so many different file formats without needing to convert them first, I've decided to stick with it. The first thing I did was import my narration as all the scenes needed to be timed to this. From there I rendered out each of my CTA3 scenes to an MP4 file, then imported them into Movavi. Once all my scenes were in place I added transitions to those that I felt needed a little more movement happening between scenes. The final job was to add in all the sound effects in Movavi (I didn't use any sound in my CTA project files). I must admit I've never used quite this many sound effects on any animated explainer video in recent memory. Usually I add the narration and a low playing music track and it works. This time I couldn't find any suitable music, so, even though I planned to have some sound effects, because there was no music, I ended up using a lot more. The majority of my sound effects were sourced from Free Sound. The full list of sound effects is in my video's description on YouTube. Other sounds were ones that come with CTA its self, and ones that came with Movavi's editor. In general I'm happy with the finished animation. There are definitely things I could improve but to get this much animation done relatively quickly is always a satisfying achievement. I don't know if it's a winning animation given some of the contest entries submitted so far but I think I may have a shot at a third place... maybe? I will say some of the business entries look nothing like any kind of business animation typically commissioned by corporate clients... so that may be my point of difference. We'll see. I'll follow this post up with a winners post after the competition closes on July 20. Wish me luck! Yes, Good Luck. It looks very good to my eyes anyway. Need time to read how you made it, as I just quickly looked at it. What's the prize? Will we see some of the others for comparison. I expect that will be in the winners. I’m keeping my fingers crissed crossed that this places 1st or 2nd—- your right, some of the entries in this catagory don’t advertise a business. It’s a great production and I was eager to learn your step though. I love that you are so honest and funny about the softwares you use and both their ups and downs. Mis managed content was my favorite. Oh it drives me crazy too looking for stuff. Great read. Good Luck in the contest. I’m going get the free box software too. Thanks for that.